Let’s compare measurements before and after translations, rotations, and reflections. For each question, the unit is represented by the large tick marks with whole numbers. Find the length of this segment to the nearest $\frac18$ of a unit. Find the length of this segment to the nearest 0.1 of a unit. Estimate the length of this segment to the nearest $\frac18$ of a unit. Estimate the length of the segment in the prior question to the nearest 0.1 of a unit. Translate Polygon $A$ so point $P$ goes to point $P'$. In the image, write in the length of each side, in grid units, next to the side using the draw tool. Rotate Triangle $B$ $90^\circ$ clockwise using $R$ as the center of rotation. In the image, write the measure of each angle in its interior using the draw tool. Reflect Pentagon $C$ across line $\ell$. In the image, write the length of each side, in grid units, next to the side. In the image, write the measure of each angle in the interior. Here is a grid showing triangle $ABC$ and two other triangles. You can use a rigid transformation to take triangle $ABC$ to one of the other triangles. Which one? Explain how you know. Describe a rigid transformation that takes $ABC$ to the triangle you selected. 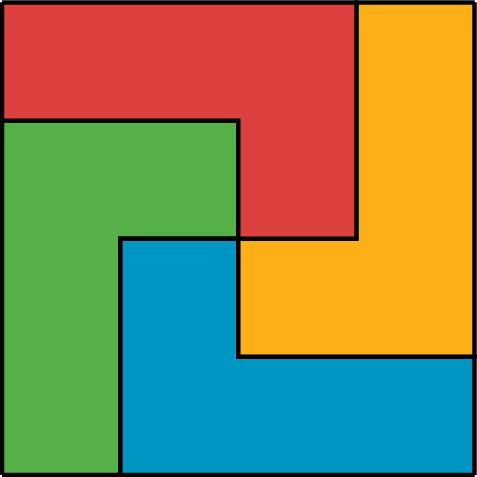 A square is made up of an L-shaped region and three transformations of the region. If the perimeter of the square is 40 units, what is the perimeter of each L-shaped region? The transformations we’ve learned about so far, translations, rotations, reflections, and sequences of these motions, are all examples of rigid transformations. A rigid transformation is a move that doesn’t change measurements on any figure. Earlier, we learned that a figure and its image have corresponding points. 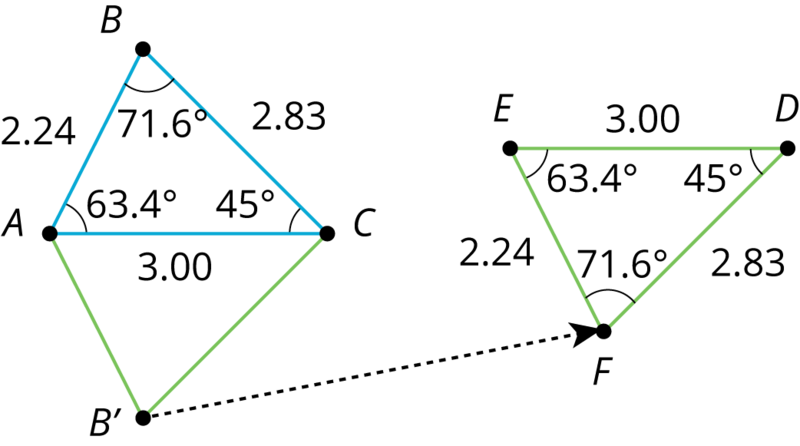 With a rigid transformation, figures like polygons also have corresponding sides and corresponding angles. These corresponding parts have the same measurements. For example, triangle $EFD$ was made by reflecting triangle $ABC$ across a horizontal line, then translating. Corresponding sides have the same lengths, and corresponding angles have the same measures. A rigid transformation is a sequence of translations, rotations, and reflections. If a rigid transformation is applied to a geometric figure, the resulting figure is called the image of the original figure under the transformation. The diagram shows a rigid transformation consisting of a translation (from A to B) followed by a rotation (from B to C) followed by a reflection (from C to D). 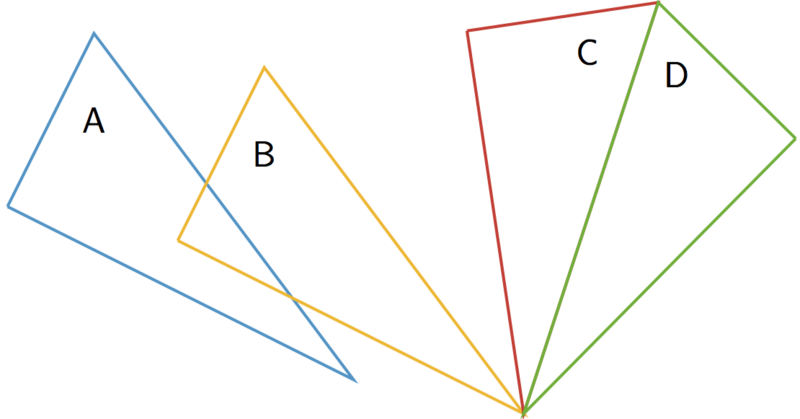 The last triangle is the image of the first triangle under this rigid transformation.